Even celebrities can struggle selling a home, as discussed in Natalie Way‘s recent Realtor.com article Christie Brinkley Relists Her 2 Homes in the Hamptons: Why Haven’t They Sold Yet? 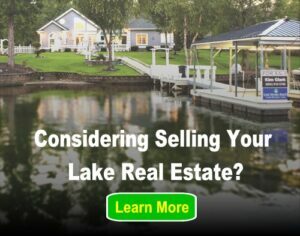 Brinkley’s homes are clearly luxury properties, much like many lake homes across the country. Unlike other homes, such high-end and niche-market homes face challenges that other homes don’t when it comes to selling fast. These types of homes are all discretionary purchases, meaning their purchase is optional. Like dinner at a high-end restaurant, no one has to pay that much just to have food, or in this case, shelter. Because of this, selling luxury homes often requires more time on the market, as sellers have to wait to match up with a buyer that has both the means to purchase such a property AND the inclination to buy now. The more expensive the home, the longer sellers should be prepared to have their home listed. This extended time commitment is just one of many reasons sellers may choose to take their home off the market and relist it later. Home was previously over-priced for that market and wasn’t going to sell. Real estate market conditions have changed. As a sales strategy, home is removed from the market in hopes it will appear “new” to the market sellers relist. The homeowner has a change of heart about selling, then recommits to selling. Sellers decide to use the home for a period of time, perhaps as a break from the interruptions caused by showings and selling. The owner chooses to try a different real estate agent and/or different marketing strategy. The owner has “finally had enough” and is ready to be more aggressive in price and strategy to get the home sold. Some of these factors sellers have no control over, such as the real estate market changing; others are just part of life. Today’s knowledgeable home buyers (and local agents) know this property is not a new listing. Buyers may wonder if the home has some problem that is making it difficult to sell. Taking a home off the market and relisting at a new price may lead buyers to believe if they wait long enough, the price may drop again. If a home isn’t on the market, it can’t sell. During the time the home is unlisted, sellers are missing out on buyers that could come along. Relisting a home may not be a magical solution, but there are steps to take that help make the most of relisting the home for sale. The marketing strategy must be very different when sellers relist. Don’t just pop the home on-and-off the market without a new approach. Make a meaningful change in the price. This signals to buyers the seller is serious about a sale. Update the property in some manner. Don’t go overboard, as some of this money will not be recouped. However, yard landscaping, new paint, new carpet, or better staging can really help a home sell faster. There are really only two reasons a home does not sell: it is not marketed well or priced correctly. However, the higher-priced the home, or the more specialized the home may be (like lake homes), the more time it usually takes to sell. Removing the home from the market and relisting is one approach used by people selling such homes. Though it does come with some risks, relisting can sometimes be another useful tool in the sales plan. Well written and to the point! Will save as a resource. Thank you! Next post: Owning a Pool: Is it Worth it?